This volume is devoted to K. F. Golstunsky, – an outstanding Russian mongolist, who was the author of many works on the Mongolian history, law and language, whose importance for Russian oriental studies can't be overestimated. K. F. Golstunsky was an professor at the Oriental Department of St. Petersburg University, where he taught for 40 years. This volume was finished in 1999, which was 100th anniversary since his death. His major works are the Mongolian-Russian Dictionary and the Russian-Kalmyk Glossary which he composed over several years. He is the author of some Mongolian and Kalmyk text-books. Professor Golstunsky also supervised the translation of Russian ortodox sacred books, e. g. Gospel, into Mongolian, which was comissioned by Synod. Among his pupils there were a lot of gifted scholars many of whose lives ended tragically in this country. 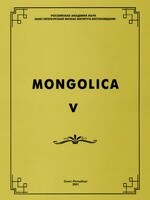 The works of prof. K. F. Golstunsky are basic for mongolists. He was an experienced and devoted scholar and teacher, who had a profound knowledge of Mongolia and Kalmykia, and he was a contemporer of the foundation of the Oriental Department. His works show new directions for research and possible approaches to solving scientific problems. This volume includes several papers delivered at the conference “Mongolian studies in Russia at the break of the centuries: continuity of generations”. A special meeting was devoted to prof. K. F. Golstunsky as well as some other seminars held at the Department of Tur-kological and Mongolian Studies at St. Petersburg Branch of Institute for Oriental Studies (Russian Academy of Science) in October-December 1999. Besides the conference there was an exhibition of works, photographs and archive materials of K. F. Golstunsky and presentation of new books on Mongolian Studies published within last three years. This volume continues a series of books, the privious volumes of which were devoted to outstanding Russian mongolist academitian B. Ya. Vladimircov (1SI one), the famous Secret History of the Mongols (2nd one), archives of Russian mongolists from the late 19th to early 20th centuries (3d one), a prominent Mongolian scholar academitian C. Damdinsurung (4th one). The first part of the volume includes materials on the history of the teaching the Mongolian language at the Oriental Department of St. Petersburg University at time of prof. K. F. Golstunsky, reminiscences about him, along with estimation of his creative and pedagogical work. All articles deal with prof. K. F. Golstunsky’s field of research. They are devided into the following parts: Historiography, Textology, Study of literature and folklore, From written héritage, From oriental archives, Our translations from Mongolian. Most of the authors are from St. Petersburg, others are from different centers of Asian studies such as: Moscow, Buriatia, Kalmykia, China and Japan. All their articles, dealing with some special subject, follow and specify the trends which were started by K. F. Golstunsky — specialist in the Mongolian literature, history, language and culture.